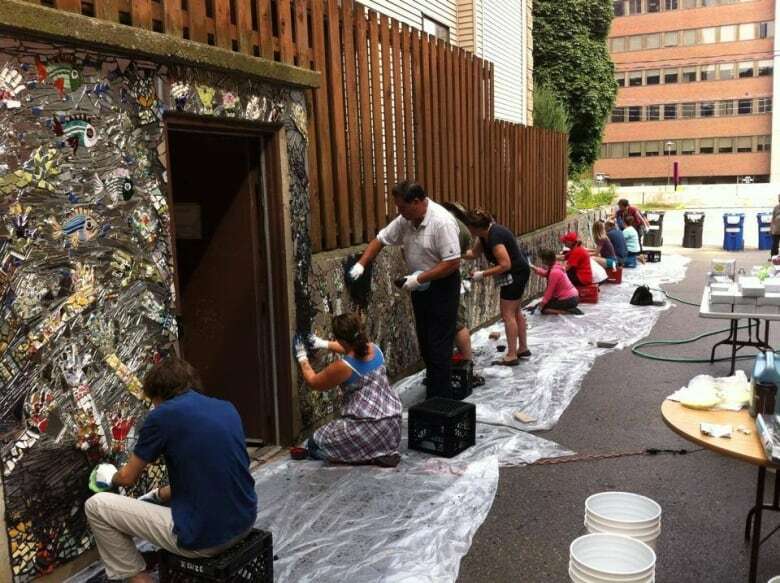 After four years, artist Meg Leslie completes mosaic mural on wall beside House of Friendship men's hostel in downtown Kitchener. 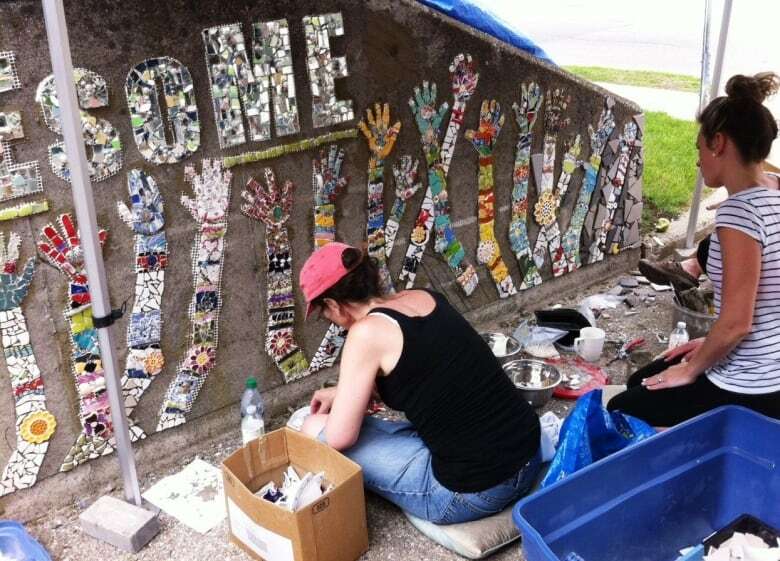 Artist Meg Leslie has spent the past four years smashing plates and other pieces of pottery and arranging the broken fragments on an old cement wall in downtown Kitchener. 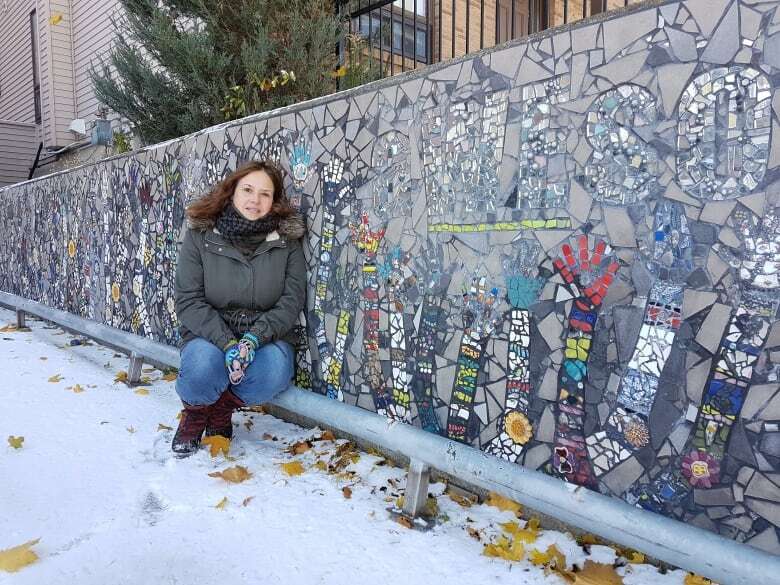 Now, on a cold November morning, she stands in front of her masterpiece: a 23 meter long mosaic of waving hands and arms, in colours that would put any rainbow to shame. "The last part I did ... was I did where my name is at the very end," Leslie said. "I told everybody this was a big deal. It felt good." The project began in 2014, after she received a $1,000 grant from the KW Awesome foundation. 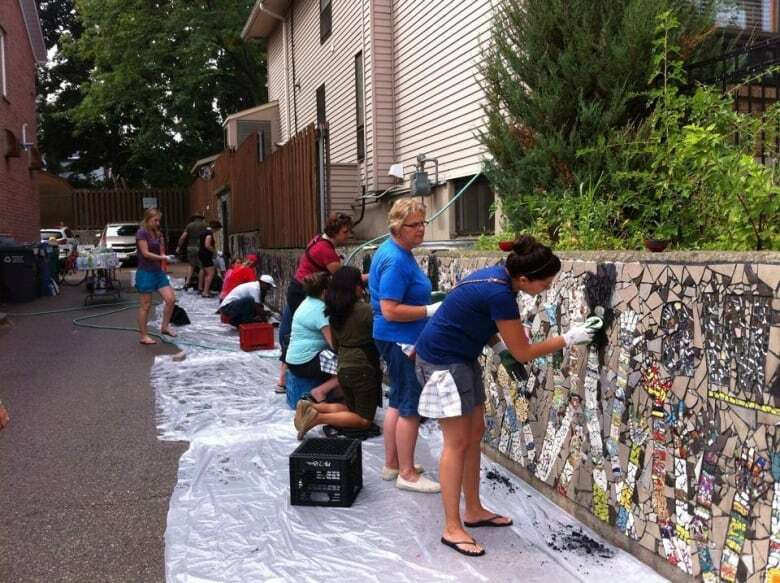 At that point, Leslie said she didn't have a clear idea of what she wanted to do, only that she wanted to tile a wall, that she wanted it to be big and involve a lot of people. She posted her idea on her Facebook page, and the next thing she knew someone from House of Friendship was inviting her to come and use one of their outdoor walls. After looking around the property, Leslie settled on one of the "ugliest" walls: a low, concrete wall that ran along the driveway beside the men's hostel. "We can stand here, we can sit here, we can kneel here. We can work on this really easily," she told people who questioned her choice. "It just made it really easy for a whole bunch of people to work all at once." While Leslie did some of the work herself, many of the hands and arms were created by people in the community who participated in 25 free workshops. 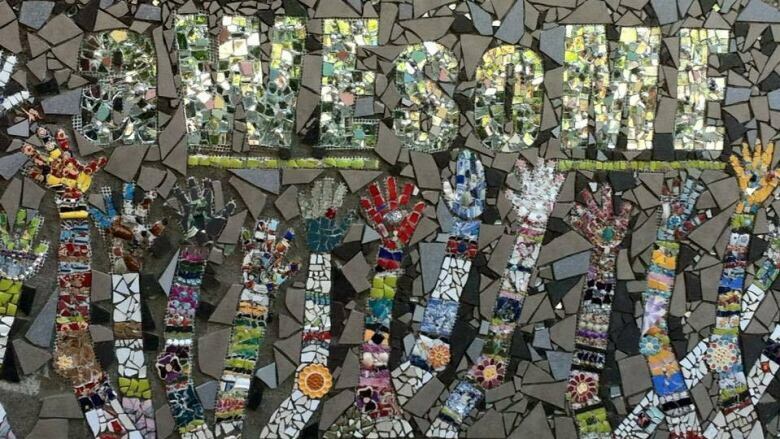 "Every hand on this wall is somebody's hand," she said, "and then different people helped with the arms, too, and then people helped with the tiles in between the hands and the arms, and then different people helped with the grout." All told, she estimates about 300 people helped with the wall. "Now that it's done, it's this huge, massive thing that I really wasn't planning on, but feel really proud that it just kind of evolved into something really cool," she says. Of course, she wasn't expecting it to take four years, nor were other people who knew about the project. She says people were always asking, "When's it going to be done?" "It was just sort of like, 'It's going to be done when it's done.' It was kind of beautiful how it was an evolution," she says. "In your daily life at work, you've got all these deadlines and you feel the stress, and I wouldn't let that happen here." Now that the wall is done, Leslie said she's not sure she would knowingly take on another four-year project like it. But she is looking for her next wall. "I always have to have something going," she said.